With Thanksgiving right around the corner and Christmas and Hanukkah right on its heels, it’s the season for all the comforting treats that remind us of family gatherings and home. Add a touch of the holidays to your coffee (decaf or regular) with some of these festive recipes. They’re a delicious boost to a mundane day or the perfect pour for an afternoon spent at home, decorating and preparing for the holidays. Plus, most of them are far healthier (and less expensive) than what you’ll find out at a chain coffee shop. We love this recipe because it offers a healthier version of this holiday favorite. Slender Kitchen offers a version with less sugar, but still includes tips and substitutions for how to achieve the perfect consistency and taste for your palette. Gingerbread -- that simple, delicious dessert that we somehow forget about all year long until the holidays. This homemade recipe uses spices and a touch of molasses to achieve that classic gingerbread flavor. If you’re limiting your dairy and/or soy intake, this recipe is a bit more complex but worth it to still get your holiday fix. Vegan Richa uses dates, almond milk, and hazelnut butter to achieve the flavor, but if you don’t have those ingredients lying around, she also offers some more common substitutions that will keep it dairy-free and soy-free. We know most people have strong opinions about eggnog, but if you happen to be a fan, this recipe is for you! Cozy up with the latte version of this recipe or serve it cold as a frappuccino if the weather hasn’t quite turned where you are yet. Heather of Heather’s Dish would argue that this drink may be a little too easy to make at home. Spoiler: all you really need are four ingredients. For a challenge (and to burn a few extra calories beforehand), try making your own homemade whipped cream like she does. The savory-sweet flavor profile of salted caramel is unparalleled in the fall and winter, and Add A Pinch blog has the answer for enjoying it at home. 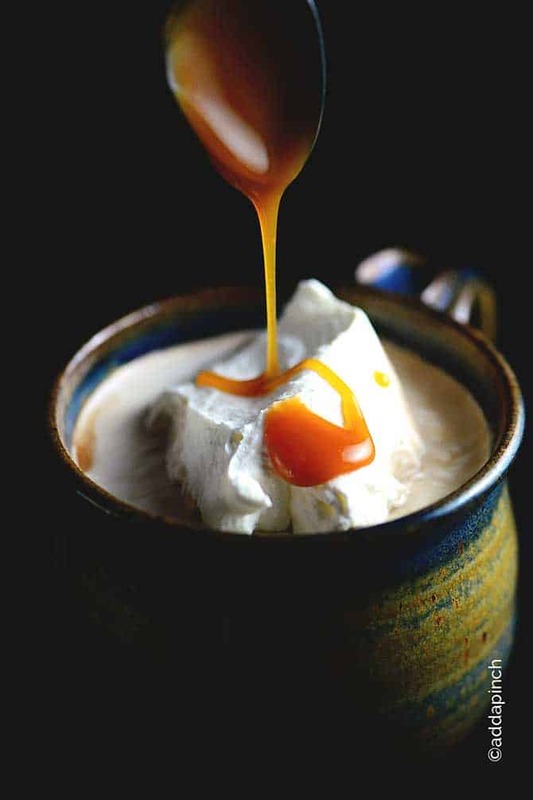 She shares a way to make your own caramel syrup and whipped cream if you’re feeling bold but emphasizes that your drink will be just as good with premade, store-bought items instead. We hope you find a recipe above to treat yourself to this holiday season--whether you’re relaxing at home with family or have a busy day ahead. What’s your go-to flavored coffee drink during this time of year?